Since I take such delight in posting bad/scary recipes from vintage cookbooks, how about if I post a good recipe. I was emulating one of my favorite food blogs, Time Travel Kitchen, and I thought about submitting this as a guest post, but now I have my own blog and am short on materials, so here it is! This is from an old Watkins cookbook, I don’t know how old because I didn’t take a picture of the copyright page, and right now I can’t find the cookbook. That is how it goes in this house sometimes. Watkins was a company that used to have sales women like Tupperware, etc. I don’t know if they ever had parties. They had spices and flavorings (like vanilla extract) and maybe cleaning products. They are still listed as a home business opportunity online. Or you can order the products online. Whenever I see someone at a fair or festival selling Watkins, I stock up. You can also buy Watkins at Walmart now, but the bottles are pretty tiny. Artsy picture of brownie ingredients. I am not really sure I succeeded in being artsy. Do you wash your sifter? Obviously I don’t. But it is flour and cocoa and stuff like that, and it would probably rust if I washed it. So there. Here is the cookbook. I also have a Watkins cookbook that is strictly salads. I did not use Watkins Baking Powder or cocoa. I did use Watkins vanilla. The book does not tell you what size pan to bake in, but it didn’t make a huge amount of batter, so I used a well-greased 8 by 8 glass pan. I do believe I cooked them at 350, that is about what a moderate oven should be. Don’t you love how these old cookbooks assume everyone will know that. 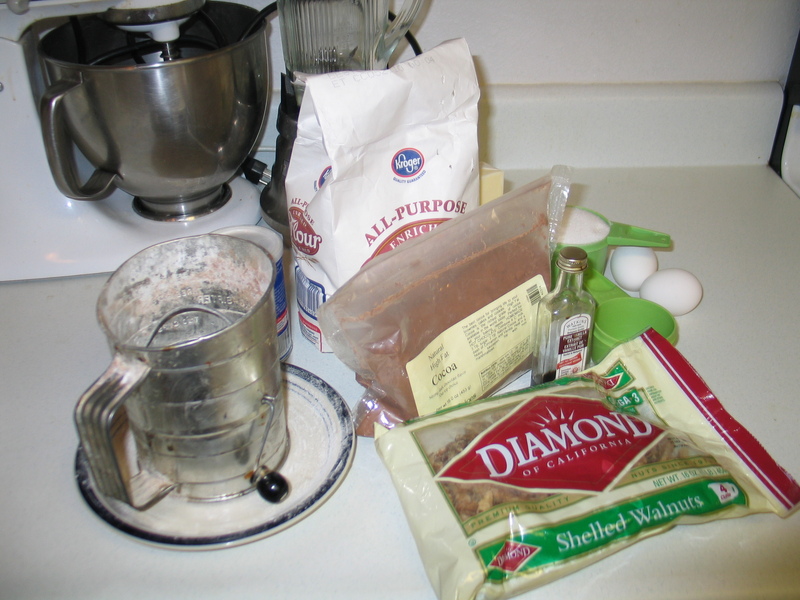 Along with “little salt” – I used about 1/4 tsp. They taste flat without salt. They kind of cave in in the middle and are all cakey and fudgy. Despite the recipe suggestion, these do not need frosting. They are quite rich already. Some of the better brownies I have ever made. Very rich. 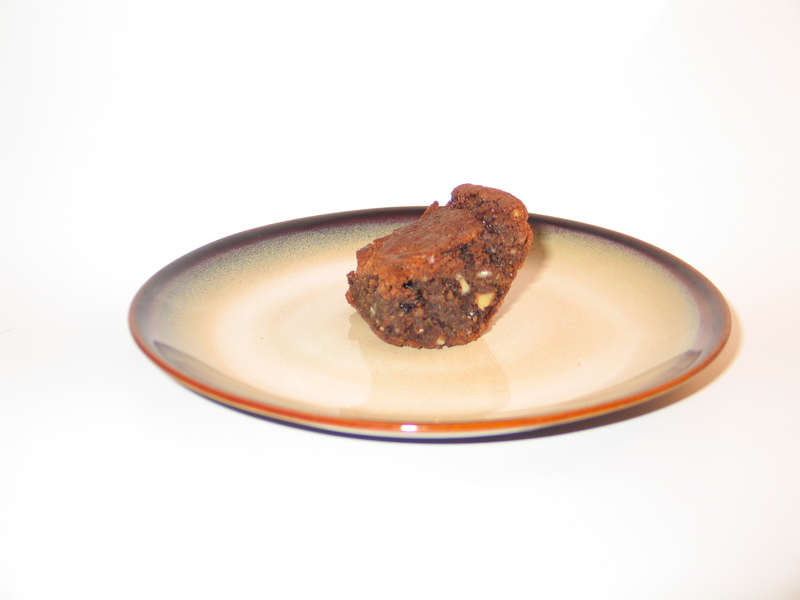 Unfortunately, I took these pictures several months ago, so I have no hot and delicious brownies to go eat now. Oh well, at least I had something to write about! So have you ever used Watkins products? 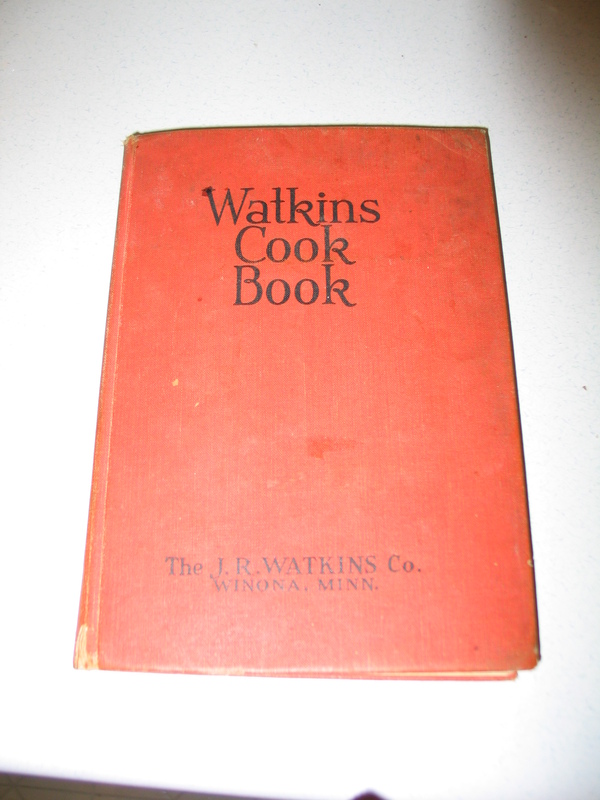 Do you have a Watkins cookbook? 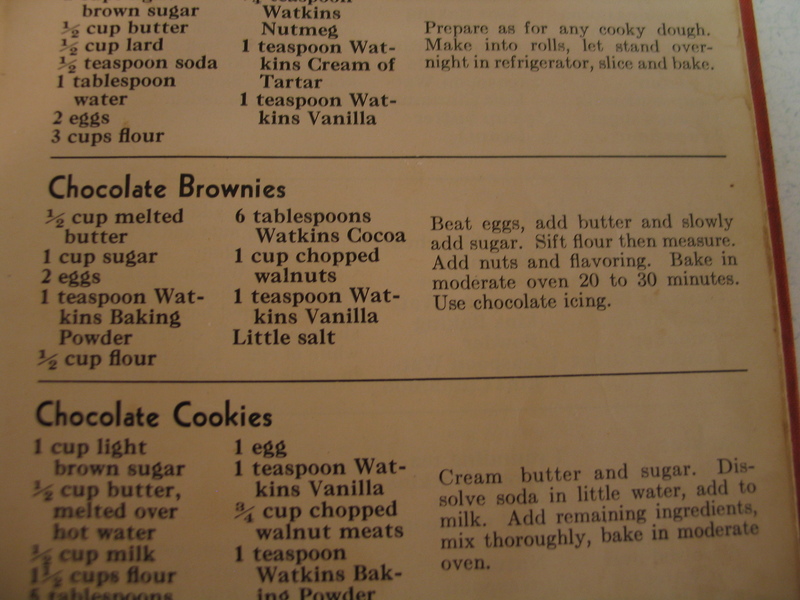 This entry was posted in Cooking, Recipes and tagged baking, brownies, Food, recipes, vintage cookbook, vintage recipe, watkins cookbook by glenderella. Bookmark the permalink. I don’t have a Watkins cookbook but I have used Watkins … especially their vanilla. That cookbook has to be very old because they were using temperatures in cookbooks when I got married (45 years ago). And I bet Mavis’ cookbooks have temperatures, too. I’m not sure when “moderate” changed to “350º” but I’m guessing around WWII??? The world changed after that war. I might have to try those brownies. I used Watkins vanilla only, until I didn’t have a dealer any more. Can’t remember when that was. I’ve never heard of Watkins products. I’m prepared to think well of them, based on their brownie recipe. I was thinking about making some treats for the 1st time we have Knit Knight back at Knit Knack, so maybe I will make those! Oh man! I have a Watkins cookbook! Yum. 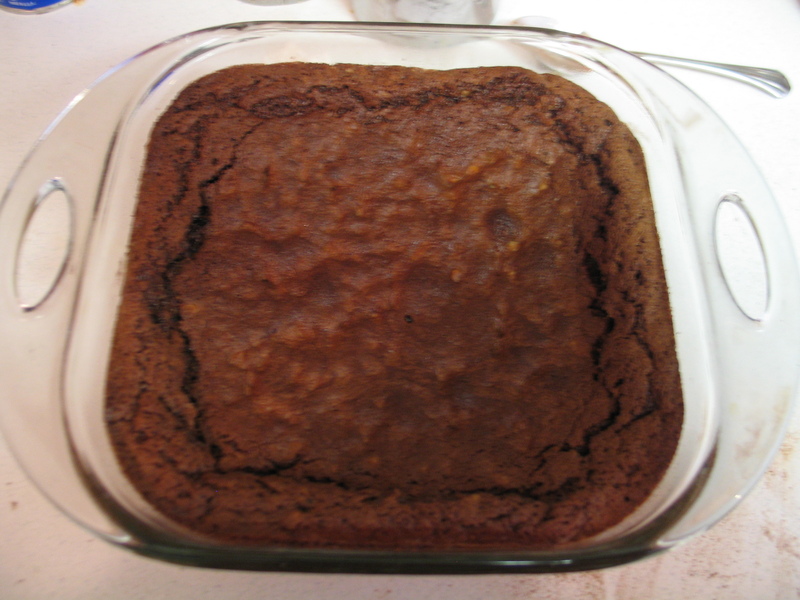 This is my favorite go-to brownie dessert. Everyone loves it. So simple but good. My mother had a Watkins cookbook but it feel apart from use. I found one in a thrift store several years ago and found this recipe. .